Nothing blows up a smoker’s spot worse than having blood-red eyes. That’s what makes eye drops such a handy sidekick for any smoker. Most eye drops conveniently fit in your pocket and do the trick in a minute. Well, some eye drops out there may be even more awesome than Clear Eyes. Today, we will look at the best clear eyes for weed, how eye drops work, and how to use them. Mirror, mirror on the wall, who is the stonedest of them all? Well, if your eyes are any indication it might just be you. So what’s with all the red when you’re smoking green? Cannabinoids cause a decrease in inner-eye pressure—this is why medical marijuana is good for glaucoma. When your inner-eye pressure decreases, blood vessels and capillaries that live within the eye begin to dilate. When this happens, your blood rushes into your eyes and causes them to swell. How do I know it’s cannabinoids causing the redness and not just smoke itself drying out your eyes? 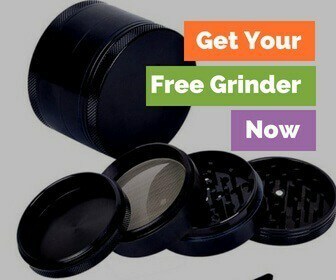 Well, because you can still get red eyes from eating edibles too. How Do Eye Drops Work? Seeing as the cannabinoids within marijuana causes a drop in eye pressure, eye drops need to step in to pick up the slack. Most eye drops contain the active ingredient tetrahydrozoline hydrochloride. The function of this chemical is to constrict the blood vessels in the eye by narrowing the pathways that have filled up with blood. Compounds in eye drops do this by stimulating the eyes’ alpha-adrenergic receptors. In turn, this action decreases congestion in the nasal and ophthalmic passages. This causes the redness to subside and your eyes to return to their natural color. When picking an eye drop to cover up your cannabis-use, you want to make sure that your eyes don’t have an adverse reaction. Try placing just one drop into one eye first and see how you react. Also, some eye drops may feel too cold in your eyes, while others may feel too hot. With time, and a little trial and error, you will decide which eye drops you prefer. 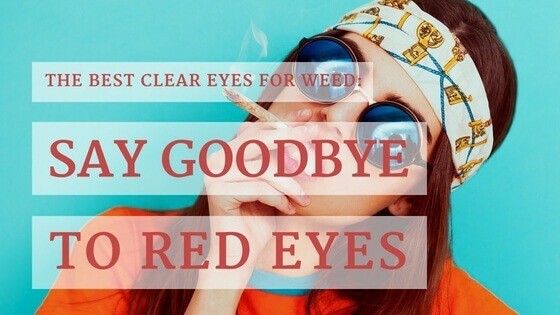 Let's look at the pros and cons of different eye drops as I break down which of these popular brands are the best clear eyes for weed. First and foremost, this eye drop looks like it could easily pass for a top-of-the-line cologne bottle. 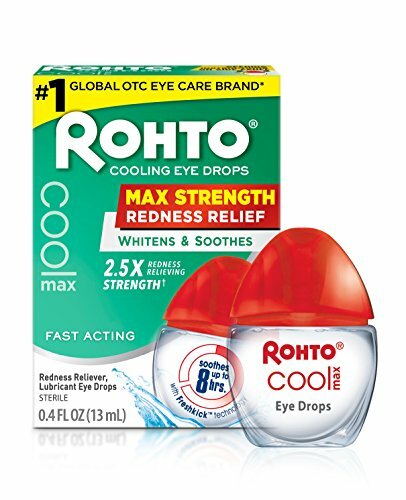 With that being said, if you’re looking to get the job done with just one round of eye drops, Rohto Maximum Redness Relief is the way to go. This is a long-lasting eye drop that not only works after a smoke session but helps fight off the reds if you smoke again a little later. What makes the Rohoto so effective is that it stays true to the cooling tagline. When we have a case of red eyes, they tend to burn and itch. Each drop is a refreshing cool wave over a bubbling volcano. What adds to the soothing nature of these drops is the consistency of the drop. It has a thicker, lubricant-like coating. Unlike other eye drops that feels like you are waterboarding your eyes, this particular Rohto actually coats your eyes as it nourishes the irritated pupils. Not only do you not drown your eyes out, but just one drop packs a massive punch. That goes a long way in saving money. A lot of times with more watery eye drops you need to get a few drops in before your eye starts to feel any sense of relief. With Rohto V's, the nanosecond that drop hits your eye, a cool shiver takes over the whole area that leaves for a unique, yet rejuvenating experience. On top of feeling super slick and extra refreshing, the Rohto Maximum Redness Relief works quickly. Within five minutes, the itchiness and dry feelings start to subside. This relief can last upwards of 12 hours. 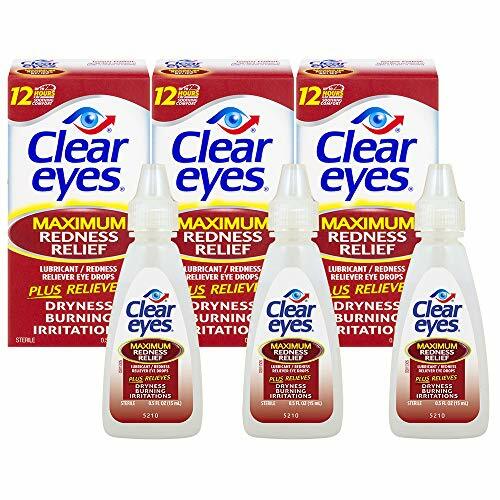 The one that started it all, Clear Eyes is many stoners’ old reliable when it comes to redness relief. While Clear Eyes truly does work, it doesn't have the bells and whistles that come with the Rohto. For instance, this packaging is the same the company has had for the last 25 years. As anyone who has ever used Clear Eyes can attest to, the bottle is easy to squeeze. Whereas the Rohto is a thicker container that you let just leak out one eye drop at a time, one light tap onto the side of the Clear Eyes bottle and you’re sinking with the Titanic. Clear Eyes will get the redness out, but it’s not a miracle worker. When it is all said and done, your eyes will still look a bit glassy. So, anyone trying to stare deep into the depths of your soul might be able to call you out (if that is something that concerns you). The only other potential side effect of Clear Eyes, is that it might do the opposite of what you desire at first. In some cases (such as how much you’ve smoked or the pollen content in the air), adding Clear Eyes to red eyes can make them a bit redder at first drop. However as the old saying goes, sometimes it’s got to get worse before it gets better. Even if the eyes momentarily get a darker shade of red, they will go away in a few minutes. Although Clear Eyes is effective and does last a while, its effects don’t seem to hold a candle to Rohto. 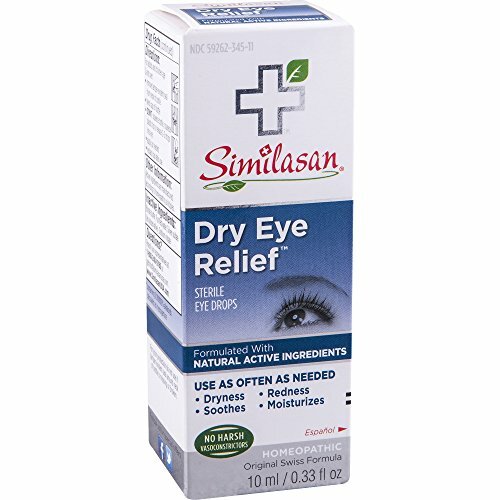 In terms of gentleness, Similasan Dry Eye Relief handles your red eyes with care. While the Rohto’s cooling nature can be off-putting to some, others might find Clear Eyes too watery. Similasan is a nice compromise of them both. One of the things that stands out about Similasan is that it is made of all-natural ingredients. This is ideal for the chain-smoker who needs to apply eye drops multiple times a day. Constantly adding synthetic ingredients to your eye may lead to long-term damage to either your eyes or your overall health. Seeing as Similasan only uses ingredients that are certified as homeopathic, adverse reactions to these eye drops are few and far in between. The worst quality of these eye drops is the twist-off cap. There’s something off about the threading inside the cap that causes it not to secure tightly around the top after repeated uses. Due to this glaring manufacturer mistake, the eye drops are prone to spilling if they happen to get knocked over. The drops themselves come out a bit faster than the Rohto, but you have plenty of breathing room in between drops that you won’t find using the Clear Eyes. That’s because the tube that the eye drop comes out of is contoured in a way that makes it easier to control each squeeze. Therefore, you have more say over how much comes out. Just ask your pocket when the cap wears out! Equate is a very run-of-the-mill eye drop. It doesn’t have the long-standing name recognizability as Clear Eyes, or the cooling nature of Rohto, or the homeopathic touch of Similasan. However, that doesn't make Equate ineffectively. There’s just nothing that stands out about it. These eye drops are easily portable, the packaging doesn’t lend itself to any leaks, and the product works fast. 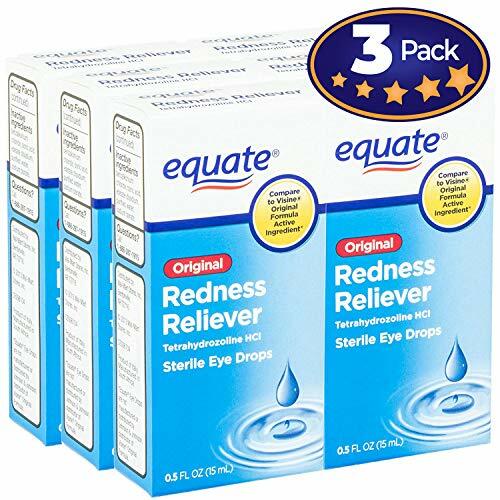 So, if you are in a gas station and you see that it is Equate that is sitting on the shelves, you can pick up these eye drops to give your stoned eyes a bit of redness relief. However, if you are looking for a more soothing, cooler experience, I would hold off until I got to an actual drug store or order some of the other eye drops on this list online. If you want to go through all the emotions when it comes to putting in eye drops, Visine gives you the whole three-act play. 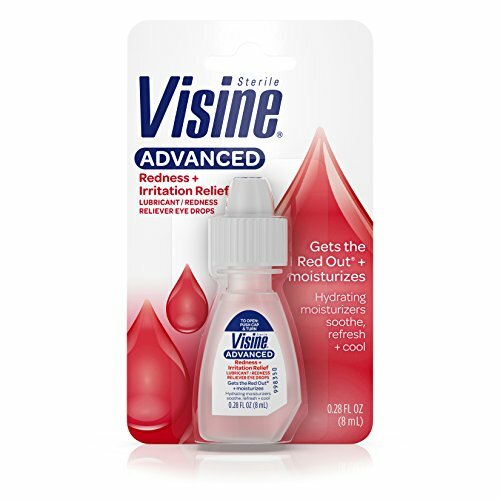 These Advanced Lubricant Redness Reliever Eye Drops start off with a soothing coolness when they first enter your eye. From there, it proceeds to normalize your eye before refreshing it completely with tears. This rollercoaster of benefits is all due in fact to the three moisturizers (Dextran, Polyethylene Glycol, Povidone) present in this Visine product. That’s because the number one goal of lubricants is to fill in the void within the eye left behind the lack of tears lying in the ducts. Keep in mind that while lubricants act as artificial tears, they are not the real thing. Real tears contain a litany of vitamins, nutrients, and other antibodies necessary for the body (and eyes) to function optimally. Therefore, if your dry eyes have less to do with marijuana and more to do with a much more serious underlying condition, cease using these lubricants. In the long-term, they may do more harm than good to your eyes. If you struggle with your eyes becoming bloodshot after you've smoked, picking up eye drops is a no brainer. Not only do they get rid of the reddness, but they are going to make your eyes feel great. Some, like Rhoto V's, can be a bit intense at first, but once you get use to them you will fall in love! Just be sure to not become dependent on eye drops. What kind do you think are the the best eye drops for when you're smoking weed? Tell us your favorites in the comments below!